Donald Trump has a Herculean task to clean up DC. The place is so infested with swamp rats and other diseased rodents, that nobody is completely clean. Take for example, Kelly Anne Conway, one of the president’s key people. As it turns out, she’s sleeping with the devil. 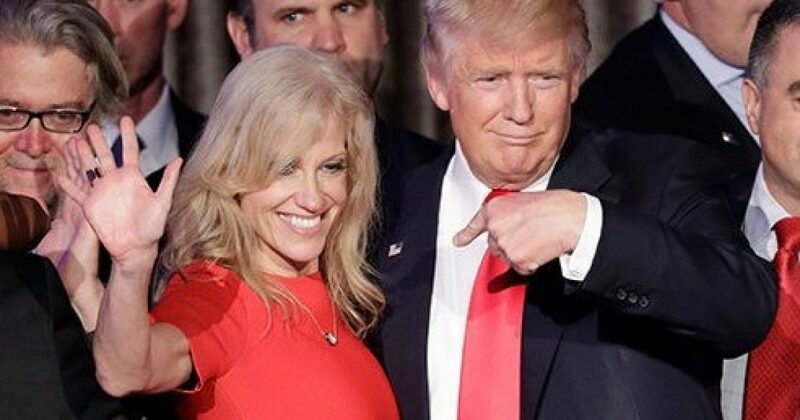 George Conway, a formerly Conservative attorney is married to Kelly Anne. This scumbag formed an organization dedicated to pushing back on President Trump. The group is called Checks and Balances. And members of the group include many former Bush appointees, like former Homeland Security Secretary Tom Ridge. Others in the group are former acting Attorney General Stuart Gerson, former Deputy Attorney General Paul McNulty and former Deputy White House Counsel Phillip Brady. Ridge served as a close advisor to President George W. Bush. Following the September 11, 2001, terrorist attacks, U.S. President George W. Bush created the Office of Homeland Security within the White House, and named Ridge to head it. The charge to the nation’s new director of homeland security was to develop and coordinate a comprehensive national strategy to strengthen the United States against terrorist threats or attacks. Mr. Gerson was appointed Acting Attorney General of the United States during the early Clinton administration, after having served as President G.H.W. Bush’s appointee as Assistant Attorney General for the Civil Division of the Department of Justice (“DOJ”). He has also served as an advisor to several Presidents. American attorney who is currently the ninth president of Grove City College (PA) and former Deputy Attorney General of the United States, having previously served as the U.S. Attorney for the Eastern District of Virginia. He held the position until July 26, 2007. He was nominated as U.S. Attorney by President George W. Bush and confirmed on September 14, 2001. McNulty was nominated to the position of Deputy Attorney General on October 20, 2005, following the withdrawal of Timothy Flanigan’s candidacy. Assistant to the President and Staff Secretary in the White House from 1991 to 1993 under President George H.W. Bush, as well as General Counsel to the US Department of Transportation. Get the picture? Almost everybody involved in this group is former Bush. The group decided to emerge from the shadows supposedly due to the appointment of Matt Whitaker as the acting Attorney General. I contend these are holdovers of the #NeverTrump crowd who believe Trump to be at a point of weakness. Where were these clowns when Barack Obama ran roughshod over the country? I guess Eric Holder wasn’t radical enough for them? And Republicans wonder why few people trust them, you get stories like this. We are far past time to stop relying on establishment Republicans. These people detest Trump more than Leftists. They feel he circumvented the system, and one of them should be leading the nation. What they no longer understand is Conservatives blew up the system. And we did it for all the right reasons. I don’t expect this group to gain much traction. But it’s clear President Trump has a dilemma on his hands. Because George and Kelly Anne are a couple. He may have to cut the cord with one of his key staffers.